Imagine there is a seven-headed rhythmic beast with a percussionist, drummer, bassist, keyboardist, two horn players, and a DJ up on the stage embracing the musical totality of the world without any folklore kitsch, its subtlety and urban club grooves crossing various divisions in musical genre. Feindrehstar is standing on the stage. The studio recordings of this unique Jena-based band have long been known to capture the live energy of their onstage performances. 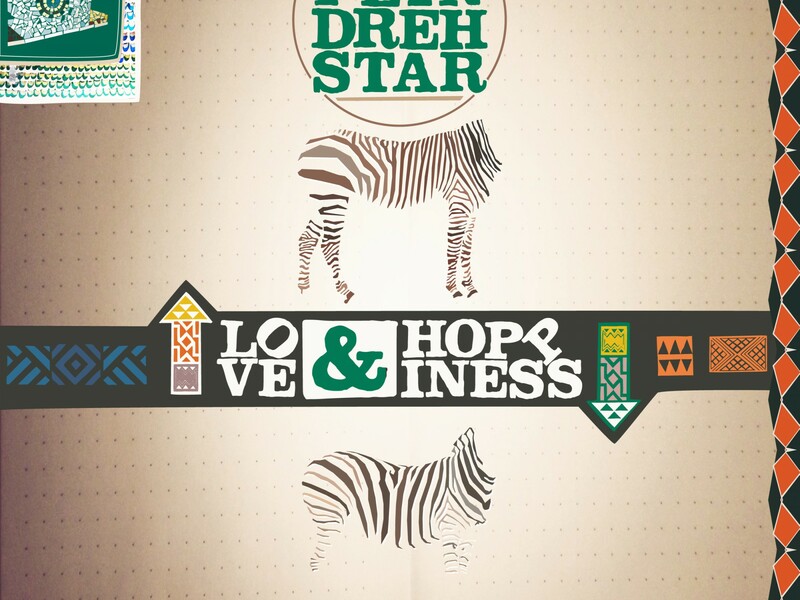 And now Feindrehstar presents their second album named „Love & Hoppiness“ – five years after their brilliant debut„Vulgarian Knights“ on Musik Krause. A lot has happened in the meantime: countless club and festival gigs, an inspiring African tour as well as countless hours spent working in the studio. „Love & Hoppiness“ matured over three years, a musical puzzle that was composed at different locations – the first recordings developed in the fall of 2012 with Michel Baumann (Soulphiction, Jackmate) and Nik Reiff in Stuttgart. Further overdubs with a trombone, violoncello, guitar and vocals followed at various home studios and conservatories. That’s right, vocals have been brought onboard this otherwise instrumental band. Owing to these vocal tracks with Dave Aju, Ebo Taylor and Tina Keserovic on the microphone, Feindrehstar’s sound continues to develop. Jazz, soul and funk vibes shine through on tracks like „Antelope“, a track featuring the vocals and guitar of legendary Ghanaian musician Ebo Taylor. At first, Taylor thought Feindrehstar rocked too hard – however in the end, things got mellow and he had so much fun that he recorded guitar tracks with enthusiasm. It was clear right from the start that everything clicked with Dave Aju – the smooth soul-soaked hiphop of „From Bob To Stevie“ standing out on the album. Feindrehstar call their music Krautclub, and the reason ought to become clear in „Caje Sukarije“: a classic Balkan funk sound taken over by wild synth loops that become fused together in a haze of electro-funk. It is in fact a Roma anthem sung by Tina Keserovic. The album takes a chiller, newer direction with „The New Ballad“, „Blues For Bagdad“ as well as the completely acoustic ballad „Love & Hoppiness Int.“ with cello and clarinet, anchoring the album in a captivating calm. Despite the many new directions, the genre defying yet danceable club sound of Feindrehstar remains. „Love & Hoppiness“, „Deep Horse“, „Shake That“ und „Night Rainer Diskodub“ show once again that after 15 years of rocking dance floors, Feindrehstar’s energy hasn’t diminished. Feindrehstar will ensure that clubs and festivals will be well supplied with their estatic performance into the future.